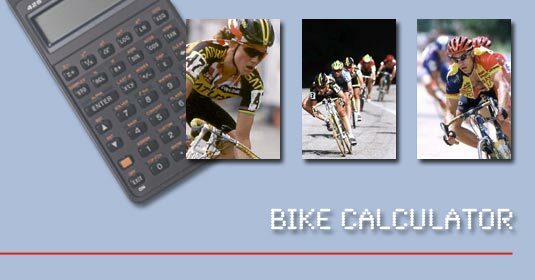 There is a new version of this calculator! On the home page. The calculators on this page do velocity prediction. You enter your power in watts and they tell you how fast you'll go. There are two independent calculators here so you can compare two sets of input parameters. A version for US units is here. There's also one with numeric inputs instead of menus for tire resistance and frontal area here. See the links at right for other calculators. Grade is distance traveled divided by rise; enter a negative number for descents. You can enter a negative number for tailwinds. Calories and weight loss are based on the effort expended; basal metabolism is not included. Do not create enemies. Carry a good tube. © 2008 Curt Austin, all rights reserved.